It's really no secret that I am a huge Stephen King fan. What may surprise people is I started reading books by Stephen King when I was around second grade. I drawn into this wild and weird world by my father. I have had a ball ever since. I think he is an incredibly talented writer of suspense. I am always in constant awe of the man in the fact that he has written so much, and the ideas just keep coming and coming. Sure, some of those ideas are bizarre and wacky, but if I had enough creativity to write a story about a fat lawnmower man who may or may not work for a Greek god who eats grass and kills people with a lawnmower, I certainly would. 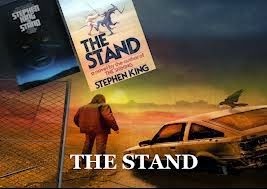 One of my favorite books King ever wrote was The Stand. In a nutshell, its basically King's ode to Lord of the Rings, an epic, fantasy which takes place in post-apocalyptic America. Its a story that I have held very dear to my heart, and so has my dad. When I was younger, I was introduced to the mini-series that came out in the 1990's. While I liked it as a child, simply because I thought it was cool that somebody acted out The Stand, I find it hard to sit through now. Most of Stephen King's great work never gets adapted properly, so it has always been a chore to see his work get translated to the big or small screen. Not everybody makes a "Misery" or a "Green Mile," or a "Shawshank Redemption" or a "Stand By Me" and that's a shame. King's work deserves to be great, but it seldom ever is great. Warner Brothers has been trying to adapt this book into a feature film for awhile now. People like George Romero, David Yates and even Ben Affleck have taken a stab at adapting this epic story into a movie. The results have always been painfully slim, which is sad, trying to imagine a Yates or Affleck version of this story would really be something. A few months ago, it was announced that Warner Brothers would give The Stand a two film treatment. While I liked that we would get any movie at all, I feel two films would never do the story justice. New Line and Peter Jackson did a solid job of adapting Lord of the Rings and I think a lot of that success came from giving each book a movie. Trying to tell all of Lord of the Rings in one or even two movies seems like a worthless endeavor. The Stand is over 1100 pages, it needs more than two movies to communicate why its such a great work in the first place. Today, it was finally announced that Warner Brothers would adapt The Stand into four movies. Makes sense, King split the story himself into four books, and perhaps the movies would be based off of that template. But while I finally began to get excited for this again that halted. The mini-series is so bad that it pains me to think of it. I am just wondering how a four-part movie can expand on that mini-series and make something unto its own. And in a world where we are constantly being attacked by post-apocalyptic, survival stories, how can Warner Brothers make The Stand feel fresh? The multiple picture format is no stranger in this world and it seems people have become comfortably accustomed to it. My question is, how much longer will these multiple movie deals last? If they are here to stay, how can we distinguish if these are just money deals for the studio or if they are real stories with something to say. If Warner Brothers plans to turn one of the best Stephen King books into a corporate tool, then I am not interested. I want this to be adapted because Warner Brothers has something cool and creative to say with it, I want them to adapt it because they care about the story and the characters and they want to pay respect to them. I will even say that not everything in The Stand works across the board. If Warner Brothers translates out the ending, page by page from the book, it will easily divide viewers. I don't want to give anything away, but its kind of a "weird" ending, and while I am a little curious to see what the general movie-going public would say about it, I think it would ultimately be a risk for the studio NOT to change it. I am equally curious to see how Warner Brothers reacts to the stuff that doesn't fully work in the book, and how they plan to confront that. Right now, living in a world of multiple movies and cinematic universes may seem cool. But I am kind of afraid that I will eventually become overwhelmed and drained by it. But I still have hope, and I want to be surprised. What do my other movie-lovers think of this type of storytelling. What do my Stephen King fans feel about a four-movie adaptation of The Stand? Let me know! Has "X-Men: Apocaylpse" found its villain? Jurassic World Trailer for Trailer Premiere! Christoph Waltz could be next Bond villain?